For more information like this, join our Telegram, Discord and Twitter! 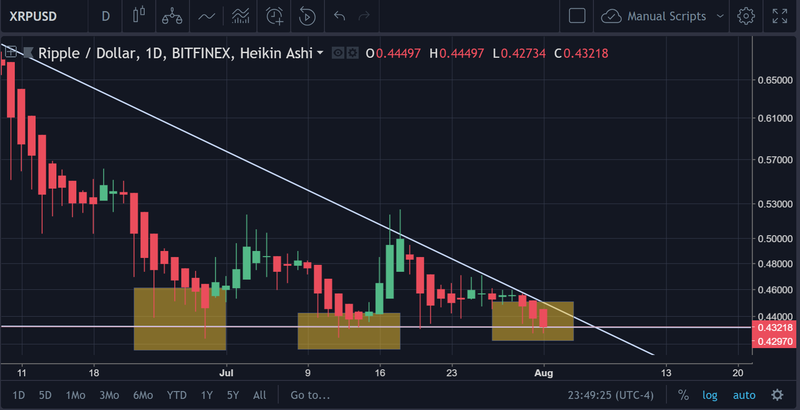 The first, most obvious thing that can be seen on the 1D chart for $XRP is the fact that the price has been in a steep downtrend since May 5th. Now, this was the point that the market, in general, began to consolidate heavily. On May 5th, the Market Capitalization of the entire cryptosphere was $469 billion. Since then, the MC has depreciated by 42% to its current total of $269 billion. Over that same period, $XRP has depreciated by 53%. As noted in several of the chats, $XRP is currently at a very long-term support point. 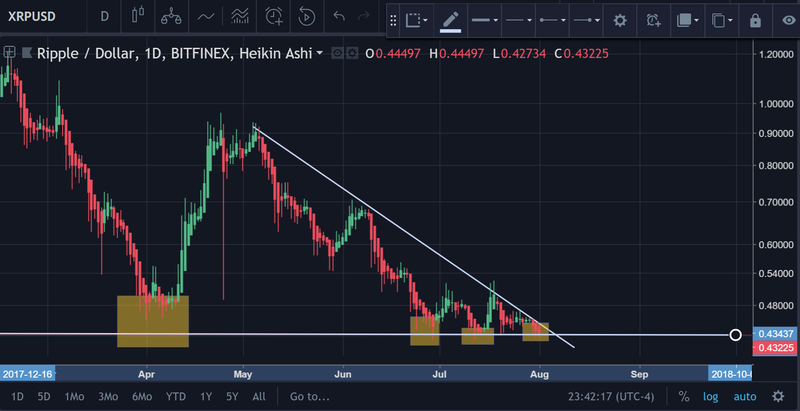 The price of $XRP has never actually crossed below the $0.40 threshold before. It has been below $.40, of course, but after surpassing that point, price-wise, it has not looked back yet. The picture above shows the numerous times that it has bounced off of this support point. However, as the downtrend from May 5th looms overhead (which will reach its 3 month anniversary soon), this begs the question of what may happen to $XRP. From what I’m observing, this appears to be _another descending triangle patter_n. General, this is a bearish chart pattern. However, there are instances in which it can be bullish. I like the fact that babypips mentioned in this article that we do not have to care WHERE the price goes to. Because we can hedge on this trade (since there are shorting options available for $XRP) in a way that will ensure that we always come out winners in the situation. We know that price is at $0.43, and there’s a lot more to lose going short than there is going long. Go to somewhere like a Mex or anywhere else that offers derivative contracts (leverage at your own discretion). Place a long at $0.43. What if my S/L on the Long Gets Hit? If my S/L gets hit on the long, I cover back over by taking out all the money left on the long and then place 50% of it on the short. I take the remaining 50% and then hold that until I feel like the price has hit its bottom and is ready to spring up, then I place another long. I would hold the short at that point in time and if the price rises by more than 3–5%, I’d close out the short, keep profits, then let my long trade ride out. What if my S/L on the Short Gets Hit? If my S/L gets hit on the short, I cover back over by taking out all the money left on the short and then place 50% of it on a long trade. I take the remaining 50% and then hold that until I feel like the price has hit its very top. When that happens, I take the remaining 50% and place that in a short. If the long position increases by more than 10%, I draw out 25% of my fiat value in the trade to minimize risk and increase the amount of $$ that I have to hedge the position once again. If the long drops by more than 2–5% from the point that its at (context matters, evaluate the situation). I draw everything out and let the short ride. Bonus Tip: You could even place everything on the short/long the second that you see the top/bottom has been it (depending on which one pans out), then just place a S/L at the entry point. [Price has a general momentum in these markets; up/down]. So, let’s say that Amy implements the strategy that I outlined above. Amy places a long and a short on $XRP at $0.43 and she waits. Amy’s places $10k on her long position and $10k on her short position. Let’s just assume that this is Amy’s entire portfolio. Amy’s leverage is 1:1, so she does not need to do any extra math to understand her losses/gains or risk of liquidation in this instance because she is not borrowing on margin. Amy then notices that the price of $XRP actually breaks upward out of the descending triangle and it hits $0.48. Amy is now -9.3% on her short and she’s +9.3% on her long. Amy now has $9,070 left on the short trade that she made and she decides to withdraw all of the money out of this bet and place 50% into her long, which is currently valued at $10,930. 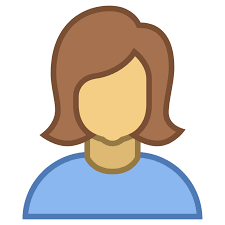 This gives her long position a total value of $15,465, with $4,535 on the sidelines ready to inject back into the markets in a short trade when Amy feels that the price has ‘topped out’. For argument’s sake, we’ll say that the price of $XRP continues to move upto $0.53. Amy’s gain on her long position has increased by +12.7%, which is a literal USD profit of $1973 (approx. ), giving her a total of $17,438 in her long position. Amy is a prudent and smart investor, so she pulls out 25% of her total investment in the trade in order to allow her more leverage in re-hedging her long position. This 25% amount adds up to $4,359 — which gives her a total of $8.9k (approx.) of cash on the sidelines with $13,059 remaining in the long trade. Amy does some T.A. on $XRP again at $.53 and sees an overhead resistance (hypothetically) at $0.56 cents. She also notices that the RSI is close to being overbought (in theory) and she’s in a bear market (in theory). Thus, Amy decides to keep her money on the sidelines and wait until the price appreciates to $0.56. Amy ends up being right and gains another 5.6% on her long position.This puts Amy at $13.79k total for her long position. Amy then decides to place a short since $XRP is at a resistance and the RSI is overbought. However, she keeps in her long position, just in case she’s wrong about her assumption. Thus, Amy places all of the money that she had on the sidelines in her short position. Then, Amy does some math and subtracts the money from her new short position ($8.9k) from the money in her long position ($13.79k), which is $4.89k. Amy then withdraws this amount from her $XRP long position and then places it in her short. Amy is convinced that her long trade will not pan out, so she sets a tight S/L on it of $0.53. Amy decides that once the price hits $0.53, she will take out all of the money in her long position and place it directly in the short position. Afterward, she will then take out 20% of the total trade and let it ride. 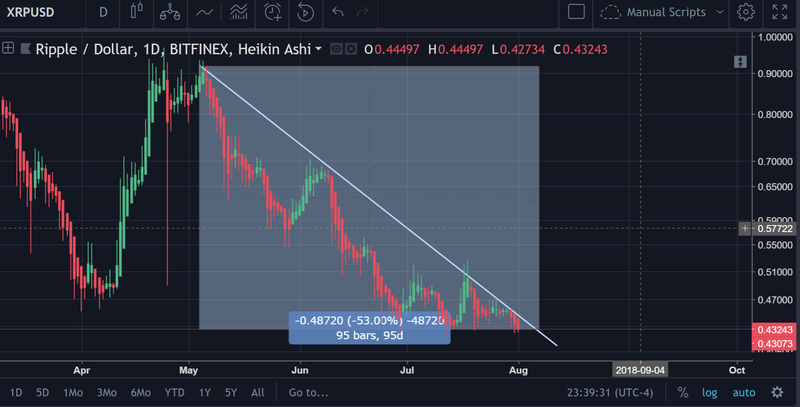 Amy knows this is a good strategy, because if the price is going down that much, it would probably hit $0.47 (which she marked as the most viable point on the other side of the downtrend line from May 5th, 2018). Sure enough, what Amy hypothesizes will happen actually comes to fruition and the price has depreciated down to $0.53. This means that Amy has lost 5.3% on her long position and gained a corresponding 5.3% on her short position. This leaves Amy with a total of $11.95k in her short position and 10.74k in her long position. Amy withdraws the remainder of the money in her long position and places it all into the short position. Now Amy’s short has a total of $22.69k in her short position. Amy then withdraws 25%, which represents a total of $5.67k and leaves her with approx. $17k left in her short position. The price depreciates all the way down back to the support (formerly resistance on the long position), which represents a total gain of +11.3%. Amy’s +11.3% gain leaves her with a total of $18.9k in her short trade. At this point, Amy is tired of trading with $XRP and wishes to divest entirely and take home all of her spoils. With $18.9k withdrawn from the trade and $5.67k withdrawn and placed on the sidelines, Amy now has a total of $24.57k. Since Amy started with $20k, this new total represents a total gain of +22.85%. Now, if you recall, the price of $XRP was $0.43 at the beginning of our example. Amy made the decision to divest at $0.48. $0.48 is only a gain of 11.6% from our initial position. So How Did Amy Walk Away With Double the Gains of the Price Movement? 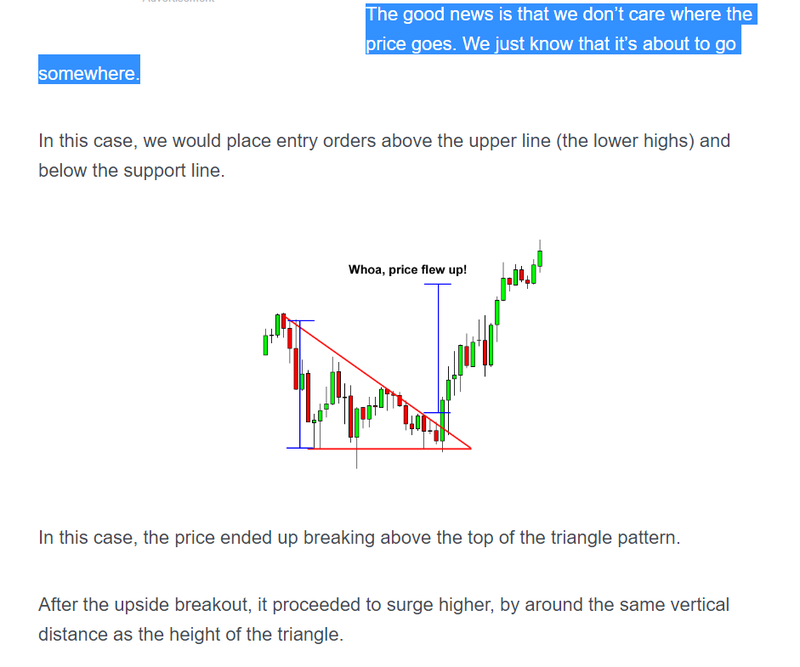 By reading the charts, understanding that there would be a big increase in price movement and hedging accordingly in order to protect herself in the markets. Amy was also smart enough to actively manage her trade, which is something that a lot of individuals fail to do in cryptocurrency, opting instead for a failed policy of ‘HODL’ing. Want to Know the Craziest Part About All of This? Amy had no clue where the price was going from the outset! She didn’t ‘guess right’ or do amazing TA! She just knew there was going to be a big increase or decrease, and she hedged accordingly so that she could close the losing side of the trade and then pile her money in the winning side of the trade that ensured that she would remain break even. When looking at chart such as $XRP, the best thing to do (in my opinion; not financial advice), is to hedge your risk as much as you possibly can. This will ensure that you are not “caught with your pants down” if the trade moves in a direction that you did not anticipate. It will also guarantee you profits, if you know how to hedge and trade correctly.